Let’s take a break from the ongoing lockout to dive back into the draft. 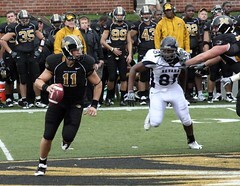 Now, after analyzing Cam Newton and Ryan Mallett, we move to another prominent QB – Missouri’s Blaine Gabbert. Gabbert is the buzzworthy guy this week, even before his Thursday pro day. He’s shown up atop mock drafts on ESPN and Sports Illustrated, and he’s now considered the safest option among the top QB prospects. But I’m not so sure. For some reason, Gabbert reminds me of Tim Couch and Joey Harrington. Couch was the first of five quarterbacks taken in the top 12 picks of the 1999 draft. I was in NYC for that draft, and it was shocking to see how Couch rose to the top of the list. He had the size, the arm strength, and the accuracy, which is why the Cleveland Browns opted for Couch. Of course, Couch busted out (as did No. 2 pick Akili Smith of the Bengals and No. 12 pick Cade McNown of the Bears). Instead, Donovan McNabb, at No. 3, emerged as the best quarterback in the draft, with Daunte Culpepper at No. 11 also meriting his spot. Here’s why Gabbert reminds me of Couch. The Missouri quarterback has prototypical size at 6-5, and he has pretty good feet as well. He also spread the ball around effectively in a college spread offense with good accuracy. But neither was known for his deep-throwing arm, which begs the question of whether Gabbert is a system quarterback, like Couch was. And that’s where the Harrington comparison comes in. Harrington was the golden boy at Oregon when the Lions picked him third overall in 2002. The Panthers, who held the second overall pick that year, passed on Harrington in favor of DE Julius Peppers. Peppers went on to have a terrific career in Carolina, while Harrington was a failure in Detroit. Maybe that memory is why I don’t see the Panthers, picking first overall this year, pulling the trigger on Gabbert. GM Marty Hurney, who made the 2002 pick, is still in charge, and he isn’t going to take a quarterback as a fallback. That’s what Gabbert feels like – the “safe” quarterback pick who isn’t the dynamic talent that most No. 1 QBs are. Gabbert was good, not great, in college, and our sense is that’s his NFL ceiling as well. Later in the top 10 – to Tennessee at 8, for example – he makes sense. But any quarterback known more for efficiency than talent is a question mark. Making that pick is how you end up with a Harrington/Couch/Matt Leinart kind of disappointment. I don’t believe the Panthers will fall victim to that trap. And that means they won’t be saying Yo Gabba Gabbert at No. 1. Three NFL teams enter the 2010 draft without first-round picks — the Chicago Bears, Denver Broncos, and Carolina Panthers. The Broncos and Panthers traded 2010 first-rounders for second-rounders last year, while the Bears included their ’10 first-rounder in the Jay Cutler trade last April. At the time, we expressed our disdain for the Denver and Carolina trades that include future first-round picks. And we talked about the ransom Chicago gave up to get Cutler. But to be fair, we wanted to go back now and examine these trades to see how the players the Broncos, Bears, and Panthers ended up with compared with the players available in the picks they would have had this year. Then we’ll make a call on whether the trade was wise. Bears (would have had 11th overall pick) – Chicago traded a bunch of picks, including this year’s first-rounder, in the Cutler deal. But the truth is that trading for Cutler still gave the Bears a better quarterback prospect than they would have gotten at either pick. Last year, their pick would have guided them to Josh Freeman, not Mark Sanchez or Matthew Stafford. And this year’s 11th overall pick would leave the Bears out of the Sam Bradford running and hoping for Jimmy Clausen to fall to them. Given that situation, the price the Bears paid for a franchise quarterback looks almost wise – even with Cutler’s interception binge last fall. Broncos (would have had 14th overall pick) – It’s strange to list the Broncos here, since they have Chicago’s 11th pick. But they traded their own first-rounder to Seattle to take CB Alphonso Smith with the 37th overall pick last year. I think a lot of Smith, a fellow Wake Forest grad, as a player, but at 5-foot-9 he’s probably going to be at best a nickel corner playing in the slot, not a full-time starter. Smith’s rookie season, which featured no starts in 15 games, and just 14 tackles and three passes broken up on the stat sheet, affirmed that assessment. Passing up a chance to perhaps get Joe Haden or to definitely get a corner from the group of Kyle Wilson, Devin McCourty, Kareem Jackson, or Patrick Robinson now looks pretty unwise. The Broncos will pay the price in terms of talent for not being able to delay their gratification last year. Panthers (would have had 17th pick) – For the second straight year, the Panthers traded a future first-rounder in last year’s draft. It worked out beautifully in 2008, when the Panthers an ’09 first-rounder to take OT Jeff Otah with the 19th overall pick. Otah has started all 25 games he’s played for Carolina, and his mauling style at right tackle has been a key to the Panthers’ running game the past two years. Plus, Carolina succeeded in 2008 so that their ’09 first-rounder was 28th overall. The lineman they missed out on – Eric Wood, Eben Britton, Max Unger – aren’t Otah’s equal. In short, that move ended up being the prototype on when and how to trade a future first-rounder. But this year, the Panthers aren’t looking as wise. Instead of giving up their ’10 first-rounder for the 19th overall pick, they traded it to San Francisco for the 43rd overall pick to take DE Everette Brown. Unlike Otah, Brown didn’t stand out as a rookie – instead, the Florida State product had just 2.5 sacks and two forced fumbles. That’s not horrible for a rookie, but it’s not reassuring either. I thought Brown was a first-round prospect, so you can see why the Panthers decided to jump on him when he slipped into the second round. And the fact that the team knew that Julius Peppers was on his way out after one more year heightened Carolina’s defensive end need. But now, as the Panthers consider whether Derrick Morgan, Jason Pierre-Paul, Brandon Graham, or Carlos Dunlap would have been available in their spot, it seems like they might regret being so impulsive. Brown could still turn into an effective starter, which will make the Panthers’ impulsiveness look more like foresight, but that’s no guarantee right now. Most of all, trading future first-rounders can become a pattern, as it did for Bobby Beathard (Panthers GM Marty Hurney’s mentor) in San Diego, and the need for a talent infusion makes such trades seem unavoidable in succeeding years. Eventually, Carolina will have to break this skein and pay the piper for these trades, and if it happens this year (or any other year) it will hurt. And that price is what makes it tough for any these trades to be worth it.